You may have heard of the key health benefits of raw cacao - A Superfood for sure, but what you may not know is that even raw cacao goes through high levels of processing when it is mass farmed and produced. The process of separating the skin from the bean can cause so much heat when done by machines that the cacao is no longer 'raw' as it's been heated beyond the magic 42 degrees. Ceremonial Grade Cacao is NOT available in the shops. You won't find it on the high street. 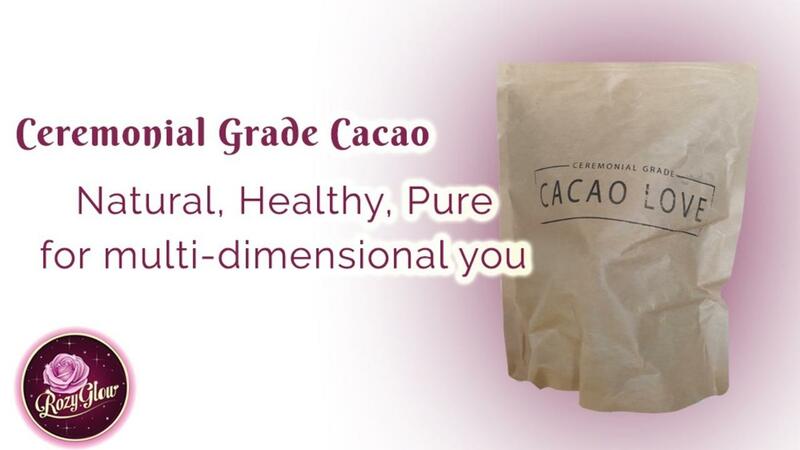 You can buy Ceremonial Grade cacao here for those who are on a path with Mama Cacao, the spirit of the cacao plant, for it is said that when the world is out of balance, the Cacao Deva comes out of the forest to restore balance and once it is restored, she disappears again. RozyGlow began as a concept when Rosanna was invited to experience her first cacao ceremony. Ceremonial Grade Cacao plays its part in many RozyGlow courses, which is why we've made it easier than ever to get your hands on the highest quality cacao. "I'm really interested in trying Cacao, but I have no idea how to prepare it!" Don't worry. Here at RozyGlow, We've got you covered. When you buy your cacao, you'll unlock our special 'How to use cacao' course featuring video links and documents on how to prepare & work with cacao, including recipes, key benefits, contra-indications is supplied with each sale. The perfect afternoon picks me up for frazzled parents of babies through to teens, that supports heart centred communication and enjoyment of the now. Antidepressants: The MAO inhibitors and Tryptophan in this cacao do not mix well with some antidepressants. Google your medication and please contact me so that we can adjust the suggested cacao dose to suit your needs. Heart conditions/blood pressure issues: Raw cacao increases heart rate significantly and is a vasodilator, opening blood vessels and increasing blood flow, which reduces blood pressure, if it's high. Caution is recommended with very low blood pressure and a lower dose suggested, though in most cases, the cacao will increase the blood pressure when it is low. Pregnant/breastfeeding: Lower doses are recommended in pregnancy or when breastfeeding. It is suggested that up to 28grms a day is fine, though best to start with a lower amount and increase as needed. Aerobic overexertion/use of sauna etc: Lower doses of cacao work very well with hiking, dance movement medicine, and yoga workshops for example. Drinking high does of cacao followed by intense aerobic activity and then a sauna, for example, would likely induce nausea and in some instances vomiting.